I don't post about every fishing trip I make, but I like to document the particularly memorable ones. Last Wednesday afternoon was definitely a memorable one. I met up with my friend Bill and his two sons to introduce them to fly fishing for American shad. The river has been fishing well the past couple of weeks. The action wasn't as fast paced on Wednesday, but the average size of the shad was larger and there were some real tough ones mixed in. 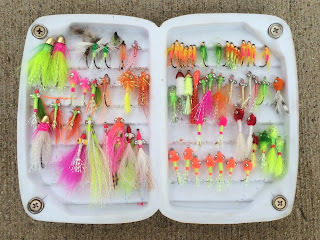 I'd rather not use split shot if I don't have to, so I've been fishing a two fly rig (mainly for weight) in all but the fastest and/or deepest water. 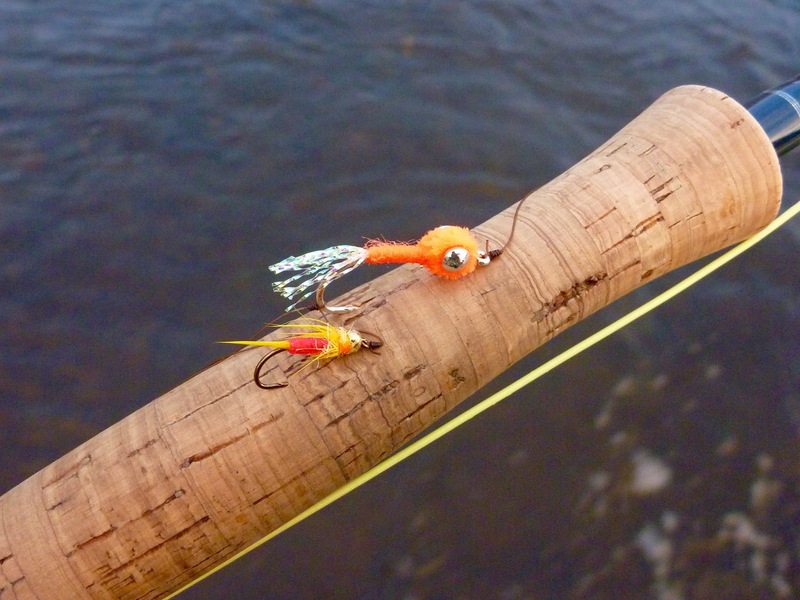 I lead with a fly with heavy dumbbell eyes and, most of the time, use a small beadhead wet fly for a dropper. When the water was really low, I used just the soft hackle fly, which was preferable. Either way, these beadhead soft hackles have been a real killer this season and this trip was no exception. I landed several shad (and lost almost as many) before the real fun began. Bill and his sons had ventured upstream to check out another pool. I was fishing near the top of a run when my line went tight. The fish gave a few tugs, then bolted down and across stream. The fish just wouldn't stop running, then began to run even faster. My Islander reel went from a steady hum to an urgent wail in seconds. It didn't take long until all of my fly line was gone. I got to see my new Hatch backing for the first time since spooling the reel last March. Then the fish jumped. Yikes! I thought she was much closer to me than she actually was. She ran again and off came a lot more backing, probably 40 or 50 yards total. And then another jump. Wait...was that my fish? It was, but she wasn't anywhere near where she was before. In vain, I tried to regain my backing, but we were at a stalemate. She positioned her self broadside to the current and wasn't budging. It was time to chase this fish. I waded briskly downstream and reeled up backing as fast as I could. The fish held in position, but started leaping again. The only way I could gain positive yardage was by moving towards the fish. I began to worry that this shad was foul hooked. Even though it fought like a fair hooked fish, I had very little control over her. 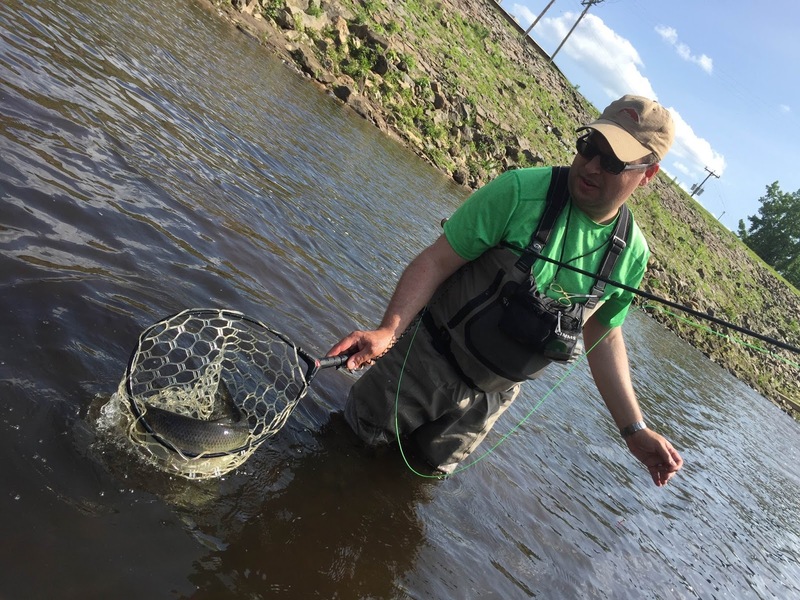 After several stressful minutes, I was 50 yards downstream from where I hooked the fish and I had finally managed to recover all of my backing. I started to reel the fish in through calmer water. The fish took several shorter runs and began jumping more frequently. 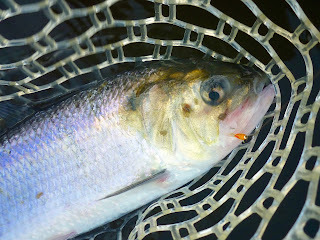 After what seemed like an eternity, the shad began to tire enough for me to reel it close. Eventually, I got the fish close enough to see that she was fair hooked, securely in the roof of her mouth. At some point in the fracas, Bill showed up and I asked him to come downstream to help net her. With a little difficulty, I was able to net the fish myself. To my surprise, she took the top fly, not the dropper. I let out a huge sigh of relief. The shad was on for long enough for me to fear losing her, but I didn't. That fish was the craziest fish I have hooked since last summer when an extremely rowdy Bonaventure grilse ran me under a row of low hanging trees, almost clotheslining me in the process. I've caught a fair number of shad this season and have had a few decent scraps, but that was the first one to take me into my backing. Bill and his sons left shortly after I landed that fish. About fifteen minutes later, another took me into the backing, but I lost it shortly thereafter. The action slowed down quite a bit as the sun sank beneath the treetops. There were sporadic hookups and fish landed. Around 6:30, lightening struck again in roughly the same spot. Another shad off to the races and I was into my backing for the third time in a couple hours. It was almost a repeat of the first demonic shad I hooked. When the fish jumped, I would realize how far it actually was from me, which was much further than I thought. With any fish, that feeling can be a little unnerving, but I love it! If I learned anything from the first crazy shad, it's that I should have chased sooner. That's what I did. As a result, this fight, while still completely manic, wasn't quite so out of control. Again, the fish was landed well downstream from where it was hooked. This time, the dropper did the trick, as it did with most of the other, more tame, fish I caught that day. Phew! Numbers wise, I've had better days, though this day was still very respectable in that department. That said, I would trade quality for quantity anyway of the week. I don't know what got into these fish. Why were they so full of piss and vinegar that day? I don't know the answer. 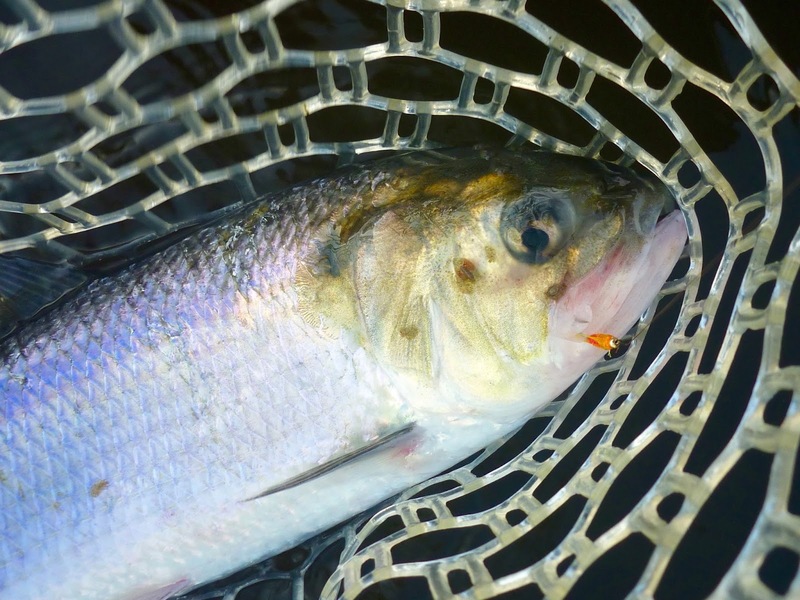 What I do know is that a hot fish on a swung fly is a thing of beauty, even that fish is just a big herring. Shad box: Some winners, some losers, & flies tied by friends. Also, plenty of interlopers and experiments.